It’s time for a third lunar chapter. We’ve talked about the physical characteristics of the Moon, and the exploration. Now we’re going to talk about the plans to return to the Moon. 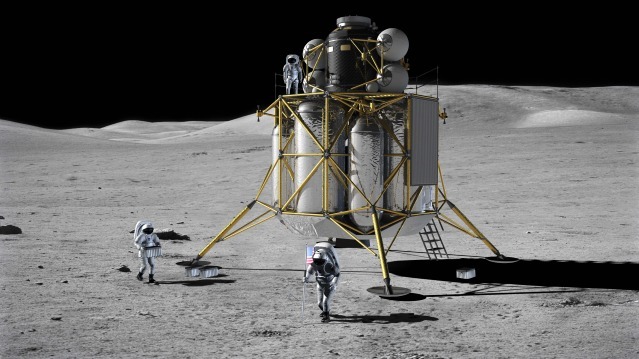 From the upcoming lunar reconnaissance orbiter to the plans to have humans set foot on the Moon again, for the first time in more than 50 years. Fraser Cain: Hey Pamela, how is Europe? Dr. Pamela Gay: [Laughter] well this is a little bit of a cheat – we’re recording this 2 days before I leave but by the time you’re all hearing this, I should be over at Munich working on Portal to the Universe with its wonderful program lead, Lars Lindberg Christensen and getting ready to hopefully meet some of you on November 23rd at Mabel’s Tavern in London. Fraser: Alright, it’s time for the third Lunar chapter. We’ve talked about the physical characteristics of the Moon and exploration of the Moon and now we going to talk about plans to return to the Moon. From the current missions orbiting the Moon right now to the upcoming Lunar Reconnaissance Orbiter to the plans to have humans set foot on the Moon again for the first time in more than half a century. Let’s just bring everybody up to speed and let’s talk about who’s hanging out at the Moon right now. In late 2008, who’s at the Moon? Pamela: Oh, it’s scary and I’m going to be made fun of but I will go for it for the sake of our audience. Forgive me Chandrayaan – 1, maybe? People really need to add pronunciations of the missions to their websites please a desperate plea from podcasters everywhere. Fraser: Let’s start with the – where do you want to start? Which mission? Pamela: Well, why don’t we go ahead and start with Selene since it’s one of the ones that have been up the longest. Pamela: Yes, the mission with two names, one of which is more pronounceable than the other. Fraser: Right, so right now – and this is the Japanese Spacecraft that took those amazing high-definition movies of the Lunar surface and Earth rising over the horizon – if you haven’t seen them we’ll link to the show notes again. They’re awesome. What are the plans for the Kaguya right now? Pamela: This is a mission that largely has proprietary data. They’re taking lots of gorgeous images, lots of laser altimetry, lots of science data and are holding on to their data for a fairly significant period of time to allow the Japanese scientists a chance to go through and get their data papers out before the rest of the world can get their hands on the data. This is fairly common with the very large array here in the United States. Scientists for instance get 6 months before their data goes public. They’re taking all of this amazing data, putting high-definition video on-line of things like the Earth rise over the Moon. Along the way they are working to try and better define the surface of the Moon and work on trying to define some of the chemistry of the Moon. There are a whole range of different instruments onboard, everything from a plasma analyzer looking for things in the atmosphere of the Moon to using a variety of different Doppler shift techniques to try and better map the mass density of the Moon. This is actually 3 different satellites that they have in orbit. One is a relay satellite and the other two are working together to do a variety of different radio measurements where as they fly over the surface of the Moon, one craft will first get accelerated by an overly dense region under the surface. Then the other one will get accelerated by this. By very carefully measuring the separation between the two different Spacecraft, they can map the density of stuff that we can’t see beneath the surface of the Moon and thus map the gravity of the Moon. They’re using these three different missions to better map out the Moon, to take very careful altimetry data by bouncing lasers off the surface off the Moon. This way you can go, ah this region looks flat but it’s denser, or rather it has a larger gravitational pull so you know it’s denser. You can look at regions and go ah, hill but less gravitational pull so it’s a less dense region. Fraser: Right and this is one of those problems that we had talked about in a previous episode. The gravity of the field of the Moon is very lumpy bumpy and if you’re trying to orbit a Spacecraft fairly low to the surface of the Moon it’s almost impossible to keep them in a stable orbit and they tend to crash. Pamela: And that’s a problem. They’re looking at things like what are reflected gamma rays coming off of the surface? Reflected is probably not quite the right word. When a Solar Flare hits the surface of the Moon you can get all sorts of neat reactions that throw off gamma rays. That helps us understand the chemistry of the Moon a bit better. Basically they’re trying to open the door for the plans to eventually put men on the Moon. This is something that is going to come up over and over in the show is all these different countries that are currently flinging metal bits at the Moon. All have the goal of understanding the Moon a bit better so that they can understand how to put people on its surface a bit better in the future. Fraser: Let’s move on then and talk about the Chinese Spacecraft. Pamela: Chang’e is a whole lot more equipment. It has a neat stereo camera where they have two different CCDs separated that allow them to get a pseudo-stereo view – well it’s not pseudo – an actual stereo view of the surface. It’s not quite as impressive as what we get with the stereo mission with the Sun where you’re separating out the cameras on two different Spacecraft, but it’s still separated and gives us a new impression. Along with the stereo camera they have their own laser altimeter that again is working to measure the surface of the Moon. They have their own gamma ray and x-ray spectrometers. It’s a lot of the same instruments over and over again as each country tries to get their: who gets the better resolution with this; who gets the better resolution of that. Each country’s program has its own strengths and weaknesses. Fraser: Right and then the last one is the Indian one. What are the plans for that one? Pamela: It’s launched; I believe it injected itself into orbit this week. It’s another mission that is out to do high-resolution imagery. This one has a lot of different instruments that are focused to try and understand the chemistry of the surface of the Moon. It has what’s called a hyperspectral imager. This is similar in technology to some of the stuff that was used to study the surface of Mars. It’s going to allow us to start understanding what are the minerals on the surface of the Moon? Again, it has its own laser altimeter to measure the surface. They are also carrying their own little side-satellite that they’re going to fling at the surface of the Moon. It’s a Moon impact probe. It’s going to be ejected and basically it carries with it a picture of the Indian flag and it’s going to basically mark another nation’s presence at the surface of the Moon. Now this mission is also carrying a bunch of instruments that aren’t Indian-made. It’s carrying some ESA equipment, some NASA equipment, again looking to try and understand what the chemistry of the Moon is. There’s another mineral mapper – M3 built by Brown University and JPL. It’s carrying a near infrared spectrometer from ESA. It’s similar to the technology from Smart-1. We’re learning how to re-use technology effectively to build more and more missions that get us more and more data by taking designs we used for one object and using them to study another object. Fraser: So, all of these missions are all going to suffer from the problem of orbiting the Moon, right? They’re not going to last too long. Pamela: It varies from mission to mission. So Selene has been in orbit for awhile. It ejected itself into orbit in 2007 and they’re planning to keep going for awhile. Current plans for Selene are that in August of 2009 they are going to de-orbit it rather violently impacting it into the surface. As far as I know – and it is hard to find information on these things on the web – there are similar plans to do the same with Chang’e. It’s just hard to keep things in long-term orbits around the Moon. There’s a lot of data to be gathered by impacting things and studying the plume. It’s possible by studying the plume of dust that comes up to start looking for water, to start looking at different facets of mineralogy. In fact that’s a good way to segue to our next mission LRO. Fraser: Right, so this is now a future mission. That’s the Lunar Reconnaissance Orbiter and when is it going to launch? Who’s sending it? Pamela: [Laughter] Well, LRO and it’s rider LCROSS is actually multiple missions all getting launched on one rocket, are planning to go up sometime in the Spring of 2009. They’re still working and settling on a date because they want to get this so that the most people are going to be able to see what’s going on. This is a two-part mission. LRO is an imaging mission. It’s going to take the highest resolution images of the Moon that have ever been taken. It also has a variety of other packages onboard to do a bunch of different spectral analyses. But LCROSS is where the coolness happens. They’re riding to the Moon on a rocket – that’s how you generally get to the Moon. Rather than just discarding the empty husk of the rocket once it’s out of fuel and leaving it somewhere between the Earth and the Moon, they’re going to carry it all the way to the Moon with them. Then they’re going to basically drop it on the Moon. They’re going to drop it in one of the regions where we believe there is probably water ice beneath the surface. We’ve looked for it; we don’t see it reflecting any light when we look in the craters. What we’re hoping is that when we impact the surface with this husk of a rocket, the plume of dust and minerals that get flung up into the air will include water ice. Flying in right behind the rocket is going to be the LCROSS probe which is going to be analyzing this plume of material for a whole four minutes. Four minutes after the rocket impacts, LCROSS is the second impactor. This is going to throw up a big enough plume that it is currently thought that amateur Astronomers with telescopes just as big as 10-inches will be able to see what’s going on. Like I said, they’re going to try and time it to get the most people able to see it. Fraser: Right. So it’s going to be kind of like Deep Impact where they had the impactor and then they had the fly-by Spacecraft analyze the plume. But you’re going to get two impacts right? You have the first impact and analysis of the plume. Then you have another impact and more analysis of the plume. So they’re really going to know at this point whether or not there is a significant amount of water ice in the impact zone for the mission. Pamela: And this is also the mission that is going to figure out where NASA is going to land Astronauts next. There are plans to help get the public involved in this. LRO is going to be beaming its data back and then releasing it to the public to get the public to look for new craters that have formed since the Apollo mission. They can look for things that were so small that the Apollo mission and the Clementine mission weren’t able to image them because their data wasn’t good enough. We’re going to be looking for what are the best most interesting sites to go and do science and what are the sites most likely to go and find water and to be able to build a hopefully permanent man presence on the Moon. Fraser: This leads to the big reason this is all happening, right? This is going to be the return of humans to the surface of the Moon. Now are there going to be any other missions from any other countries before then? Pamela: Well, there are lots of different people who are looking for different ways to go there, including ourselves. The United States also has additional missions planned to go and continue doing more mineral analysis. We’re looking at GRAIL. It’s planned to launch hopefully in 2011. It’s the Gravity Recovery and Interior Laboratory mission. It’s going to go and do more mapping of what’s the density structure of the Moon. Then there’s the Lunar Atmosphere and Dust Environment Explorer (LADEE) that’s also looking to go up in 2011. So there are two more U.S. missions. The Russians have missions planned although the dates keep shifting a lot on theirs. The Europeans are looking to start launching their own missions as well and everyone is trying to find their own way to get humans up there by roughly 2020. Fraser: Okay, but the most put together of that right now is NASA’s Constellation program, right? Pamela: I wouldn’t go so far to say it’s the most put together. I’d say it’s the one that probably has the most websites put together. Pamela: But China and India are both working very hard on this problem as well as is Russia. All of these nations are throwing tremendous resources at their manned Space initiatives. So it’s hard to say which one is going to get there first or which one is the most likely to get there first. China and India are the new kids on the block and China is doing well getting their manned missions going and they have a very focused goal. They may not get there as flashy as we get there, but I think they’re going to get there just the same. What’s interesting is as all these nations are looking to go to the Moon together, they’re looking to do things like build International Communications Networks. They’re looking at all different ways that they can work together to combine resources. Now NASA does have some cool toys on the table that I haven’t seen coming out of the other countries yet. For instance we’re looking at how we can build Rovers in a bunch of different ways including Rovers that are capable of basically carrying around a human habitat so that you essentially have a “mobile home” on the Moon. If you get tired of doing research one place, get in your Rover and go someplace else and dig in the dirt in a new playground. Fraser: Now I think a lot of people know how the Apollo missions worked to get people to the Moon. There was the Saturn 5 launch that had the capsule on the top and would fly out into orbit and it would re-dock with itself to get itself into a state where it could go to the Moon. It would then orbit the Moon and the Lander would go down to the surface while the Command Module went around in orbit. The Astronauts would get out on the surface, they’d explore and do whatever and then they would hop back into the Lander and it would fire a retro-rocket off of the (I’ve got really great hand gestures here that no one can see) [Laughter] and the Lander would then fly back into Space, re-dock with the Command Module. Then they would fly back to Earth and just the final landing capsule would be the thing that came back through the Atmosphere. Now, how is the Constellation Program going to be similar or different from what happened with the Apollo program? I know that in the beginning they were planning some ideas that were actually pretty different from the way the Apollo missions were going to go. But now when you look at it, it all kinda looks the same. Pamela: [Laughter] There are some fundamental differences. One of the things that’s kind of cool about Constellation is they’re taking an approach of basically Lego Robots. This is how I think of it. They’re building a set of different discreet parts that can be put together in a variety of different ways. There are crew modules that can be used to go to the Moon or be used to go to the International Space Station depending on what you attach them to. Fraser: Or maybe even an Asteroid. Pamela: Right, or Mars. That’s where they’re hoping to eventually get to is Mars with this program. There are two main sets of rockets with this. The Ares I and the Ares V. To say the Ares V is big is an understatement. Fraser: Yeah, that is a big rocket. Pamela: [Laughter] Physically it is significantly bigger just in terms of bits and pieces that the Saturn rockets were. Take the main Saturn rocket that you’re used to and then slap on the sides of it two of the solid rocket boosters from the Space Shuttle. It weighs a lot. Fraser: Right and the goal with the Ares V is to just carry cargo, right? It is to be a heavy, heavy lifter that can put massive amounts stuff into orbit not entirely safely, right? [Laughter] You know, as safe as possible but not super safe. Pamela: Right, so they’re currently looking at being able to lift into low Earth orbit close to 200,000 kilograms – 400,000 pounds basically. But in order to get all the way to the Moon, 71,000 kilograms or basically 160,000 pounds. It can lift a lot but when they’re trying to get people to the Moon, what they’re going to do which I think is pretty cool, is they’re going to take the Lunar Landing Module, the little thing with legs that you’re used to seeing in gold foil from the Apollo missions – they’re going to be carrying something very similar to that up into orbit, but they’re not going to carry the people. What they’re going to do is use the Ares I instead to launch people into orbit; to launch the crew capsule into orbit. With the Ares I, it’s a lower lift vehicle again built on many of the same pieces as the Ares V but is just configured differently in this case. Fraser: Right with an eye towards safety though. In this case, this is a vehicle that will SAFELY carry the relatively lightweight crew and their equipment into Space. So, it won’t have to be big and it won’t have to be a gigantic amount of explosive fuel. It will be a fairly lightweight and very safe vehicle. Pamela: It’s essentially one solid rocket booster from the Space Shuttle; random bits. Then on top of this is a very well designed crew capsule that when you first look at it brings back thoughts of Apollo, Gemini, of Mercury. You have that standard cone-shaped craft. But it’s a lot bigger. It’s capable potentially of carrying up to six people they say. The way it’s built it’s actually housed within a sheath with another rocket up on top of it so that if something starts to go terribly wrong they can fire this additional rocket, separate from the main rocket behind them and take off and hopefully jettison themselves to safety. Fraser: And so thinking about some of the crashes that have happened so far, this would have solved the problem so far for example – maybe – with Challenger where there was a problem with the Spacecraft. They could have pressed a button and ejected off the top of the rocket instantaneously and try to get away from the explosion. They’re definitely trying to take into account ways to deal with a catastrophic failure of the vehicle even while it is launching. Pamela: One of the scariest things about the Space Shuttle is you’re essentially on the side of a rocket. You are bolted to liquid fuel. With this, you’re on top of the rocket so yeah, everything can go terribly wrong but at least you’re not engulfed in the fireball, you’re on top of the fireball. They’re using as much of the Space Shuttle technology as they can. While the computers on the Space Shuttle really you don’t want to re-use, a lot of the mechanical parts of it are sound technology. For example the solid rocket boosters, the engines and they’re re-using those technologies to accelerate the Constellation Program. Whenever you put a human into Space you have to put the equipment much more extensive testing than you have to put through if you’re just launching an exploratory Space probe that doesn’t cost a lot of money. By re-using Space Shuttle technologies, they accelerate timelines and they lower development costs. Fraser: Once again, similar to Apollo the Ares I is going to launch, the Ares V is going to launch and they are going to hook up in orbit and then do a transfer orbit to the Moon, right? Pamela: That’s the current plan and potentially even do a transfer orbit to go to Mars. But, that’s much further in the future. Fraser: So then they’ll head to the Moon and orbit the Moon again and this is all going to seem very reminiscent. They’ll be able to land various sizes back down onto the Moon. They’ll walk around and then fly back up to the command module and return. Pamela: They’re also looking at delivering the equipment ahead of the Astronauts so that basically when they get there, they are ready to go. Fraser: This is really key for a lot of the Mars missions because in the far, far future as we mentioned in the previous episodes about Mars, you’re going to want to send your fuel-builder to Mars six months before the Astronauts ever get there. Then you’re going to have to try and land right by your fuel factory and make sure you’ve got everything working. So being able to land one Spacecraft and all of your equipment and then land the people where your equipment is will be really important. And especially if you build a base, you know eventually you’ve got a base you want to land at the base, not just wherever you end up on the Moon. Pamela: One thing that we need to remember in talking about this is yes, India, China, Russia, and ESA are planning to go, the U.S. is planning to go as a NASA task. But then there’s Google off to the side funding the Lunar XPrize which is a commercial program to challenge the commercial Space race to get a Rover on the surface. Getting a Rover on the surface is just one step in getting people on the surface and there’s no reason to think that the commercial Space agencies aren’t going to be right behind or perhaps even ahead of all of these governmental agencies as we race back to the Moon. Fraser: Now assuming that everything goes well and the schedules are kept perfectly, when can we hope to see humans set foot on the Moon again? Pamela: Oh, that depends on who you believe. Realistically I honestly think we’re looking at 2017 at the earliest and more likely out at 2020. Fraser: And that will nicely sync up actually with the 50th anniversary? Pamela: That sounds about right. Fraser: Right so that will be the 50th anniversary of the Apollo missions we may see humans walk on the Moon again. Now we’ve just glossed over there. So what was Google’s plan? They’re looking to do a private prize very similar to the XPrize in that this is a 20 million dollar prize for a privately funded team to get a Rover onto the surface of the Moon. They’ve got a bunch of requirements. You’re going to have a private entity within a few years have a Rover on the Moon. Pamela: What’s kind of cool is they’re setting realistic expectations on this. You get your 20 million if you land and you rove 500 meters which is half a kilometer for a little robot that potentially – remember Pathfinder this could be like the size of a small child’s pull wagon – but if you can go 5 kilometers (5,000 meters) there’s potentially an extra 5 million in it for you. Which is nothing compared to the cost of what it will take to run the mission. They’re giving people realistic incentives and realistic challenges. It’s going to be fun to watch what happens. Fraser: Yeah, and so then if everything works out, what the kind of long-term return to the Moon look will like for NASA, I mean they’re the best that we know right now. 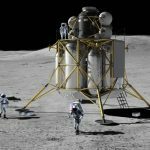 Are there going to be more Lunar missions and eventually a base? Pamela: The idea is to establish a permanent man presence in Space and the Moon is one of the easier places to do that. International Space Station is a great start but from the Lunar surface we can start to construct things. We can build things in a lower gravity environment but still have some gravity which some people find easier to sleep in and easier to function in. There’s potentially interesting things to mine on the Moon. We’re still exploring that. That’s part of where all of the mineralogy instruments on all of these missions come into play. It’s just a cool place to go explore. We can all envision that future based on watching too many SciFi movies of looking up at the quarter Moon and seeing the shadowed half lit up with cities of human beings living out there in Space. It’s a jumping off point for Mars. We can go there and acclimate to Space and then hop from there to Mars once we’re acclimated. Fraser: That will be so cool, seeing the Moon and seeing cities on the Moon. Pamela: It could happen in our lifetime. We’re still young. Fraser: Yeah [Laughter] Isn’t that what our parents said? Isn’t that what our grandparents said? Pamela: [Laughter] Yeah, I know. Fraser: Yeah, 50 years. Let’s get it. Fraser: Where’s my flying car? This time we’ll stay. We’re going to go back to the Moon and we’re going to stay. We’re going to explore it and live on it. And that’s that. Pamela: It’s a good future. Fraser: Yeah. We’ll talk to you next week. Enjoy Europe. Next time. I was hoping to know more about the Indian Mission to the moon since they’re newest kid in the block. But not much mention given. Very bad. Rest of the episode was ok.
Great show. I’ve been listening to all your shows since I discovered Astronomy Cast. I watched Neil Armstrong set foot on the Moon. I took photos of the TV screen. It was an amazingly exciting time, with a seemingly bright future for the exploration of space. I was a young boy with stars in my eyes at the time, and great hopes for space. Now, I’m a much older man, still with stars in my eyes, still hopeful for a bright future for the human race in space, but a bit disappointed that we have spent far too much time with our heads down, looking at the ground at our feet, instead of holding our heads high, using these marvellous brains of ours, and aiming for the heights, and the incredible riches, both scientific and material, which await us there. I loved the moon series, the Moon is so tangible a goal for us. Best part about this, probably my favourite thing from this whole podcast (and I love this podcast) is Fraser sort of going falsetto as he says “That would be so cool”… like he was lost in reverie. Loved it. Encapsulates so much.